Men's Spring 2012 Is Looking Like A HOT MESH! 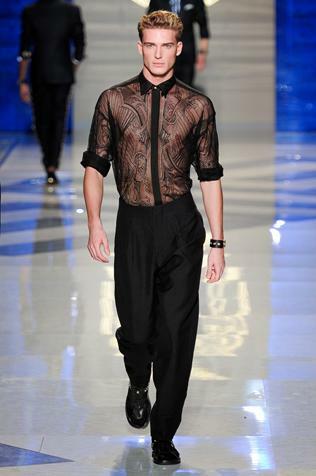 Above: This look from Versace's Mens Spring 2012 line is a prime example of looking like a HOT MESH! You better not even think about it! 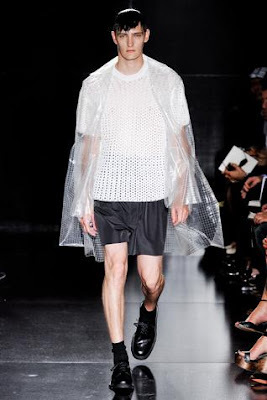 It seems men have been pretty daring these past couple of years with fashion. We have seen skinny jeans, man bags, shorty shorts, ankle cleavage, mandals (gladiator sandals), low cut tops, tops with no sides on them and now mesh? Oh hell to the naw! We have to put a stop to some of this madness ASAP. 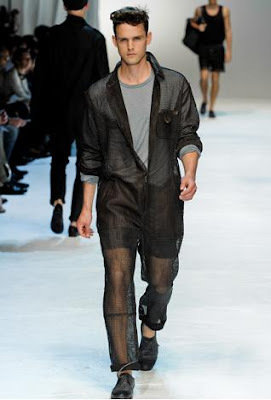 Remember Armani's Male Monokini disaster from Spring/Summer 2011?! YIKES! Like I said in last June's post about the Male Monokini, I don't care who made it or how much it costs. 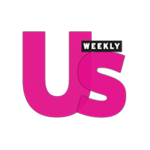 Some things are fug and we need to start holding designers accountable for the nastiness! Let's take a look at this seasons offenders shall we? So I am just going to start with the top offender: Dolce and Gabbana! What the hell is that?! Why, it appears to be a mesh jumpsuit from their Spring 2012 Mens collection. To add insult to injury, whoever styled the show decided to cuff the bottom of this "outfit" because when you wear mesh you should probably cuff it for a more casual vibe. We are just getting started! Because the mesh jumpsuit was probably way to formal and daytime to wear on the weekends, Dolce and Gabbana was nice enough to give you the same thing but it shorts for the Kelly Rowland in all of us (remember how Beyonce always wore the skirt verison of the outfit, Michelle would wear the pants version and Kelly always rocked the shorts). I don't have as big of an issue with these shorts but please, PLEASE do not wear these to a more upscale event and think that you are cute. Moving on! 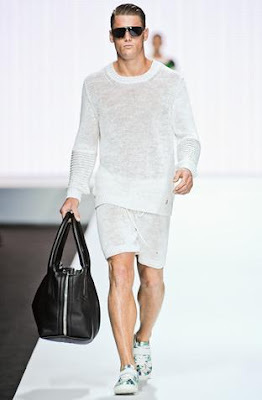 No this look is not Jil Sander for Bed, Bath and Beyond; it is Jil Sander Men's Spring 2012 and it is well... something! It does however look like the stalk boy who works at Bed, Bath and Beyond but secretly longs to design stole some shower liners and went to town on some shower chic looks. I mean the flattened hair on the model total says "shower me with flashbulbs!" 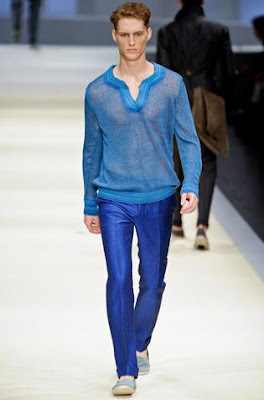 I really don't know of any occasion where any man would need to wear a bright blue mesh Moroccan inspired top BUT just in case Canali made one in their Mens Spring 2012 collection. PHEW! Now it is time to take a look at some pieces that I don't mind! 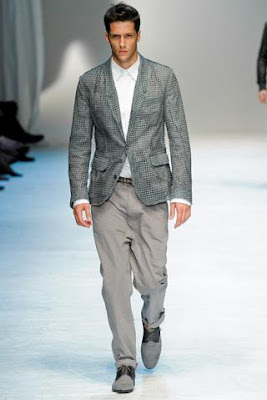 This blazer from Dolce and Gabbana's Mens Spring 2012 collection is actually really interesting. I think worn with the right shirt it could make an amazing statement piece like in the photo of the model. I don't mind this set from Dirk Bikkembergs Mens Spring 2012 collection as maybe something to keep cool and work out in but you know people are going to wear it anywhere and everywhere. 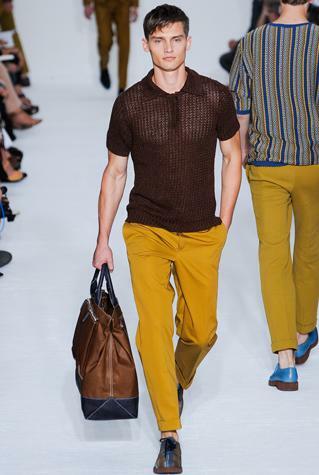 I am not a huge fan of this top from Z Zennga's Mens Spring 2012 collection but I like the way it is paired with this mustard color pant on the runway! Really the reason why I featured this picture was to talk about how Mustard is going to be a hot color for men in Spring 2012! At the end of the day I love creativity but some pieces should just be left on the runway! Like a lot of things in fashion some of these pieces should only be tried by the few, the daring and the in shape. When picking out clothes next spring just remember men that most of the time Mesh is not an acceptable article of clothing! Now go forth and look like a hot mesh at your own risk! *All photos were taken from GQ's website via their Milan Fashion Week 2012 slide shows. To look at more men's fashion and looks and trends from Milan visit the GQ website by clicking here!